The Netherlands is a small but influential country in Western Europe. It is a core member of the EU and the Schengen area, and has an excellent geographical location and travel connections for international business opportunities. The country’s favorable tax regime is also ideal for international tax planning. 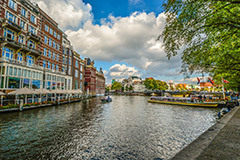 The Dutch residency-by-investment program is aimed at ultra-high net-worth investors, providing fast-track residency with a range of benefits: you and your family will have unrestricted right to work in the Netherlands, have access to a host of social services such as maternity benefit and medical treatment, and visa-free travel within the Schengen zone. Applications are processed within 3 months. By investing in the Netherlands, you will receive a residence permit valid for 3 years. This will give you an unrestricted right to work, as well as access to social benefits and medical treatment. The RP can be extended further if the original criteria are still met. After 5 years of residing in the Netherlands, you can apply for permanent residence or citizenship. As soon as your residence permit is granted, you and your family will have full visa-free access to all 26 countries of the Schengen zone in Europe. If you acquire Dutch citizenship, you’ll have visa-free access to over 150 countries including the EU, UK, Australia, Canada and the USA. You have to invest at least EUR 1.25 million in a Netherlands-based company. Investing in real estate for private occupation is excluded. The amount has to be deposited in a Dutch bank or an EU bank with a branch in the Netherlands. The value added by your investment to the Dutch economy will be assessed with a points system. The evaluation criteria include creating at least 10 jobs within 5 years, introducing a technological innovation, and creating non-financial added value such as knowledge or networks.